Introduction: Have you heard of Reel Time Designs? Perhaps their innovative hook hanger will jog your memory. The company has a patent on a well known drop-shot weight keeper system, and this system has now been incorporated into the company's own branded rod series called "Harmonix." About Reel Time Designs: The original keeper design also is sold as a stand alone product and is attached to any rod blank with a special tape that will not damage or mar rods in any way. The keeper is available in black paint overlay, and titanium-coated black over stainless steel. Reel Time Designs is run by Steve Kokai and Diane Johnson and Harmonix rods is their latest venture which blends their original hook keeper with a rod that is designed to be durable, sensitive, and above all affordable. 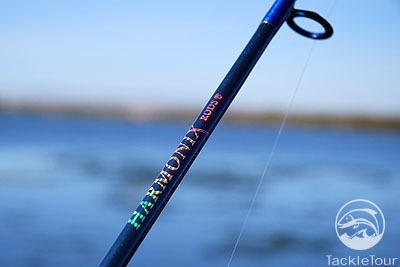 Impressions: Harmonix rods are available in both spinning and casting models and there are a total of 8 spinning rods and 5 casting rods available. The casting rods are application specific and designed for specific baits while the spinning rods are broken up by species. 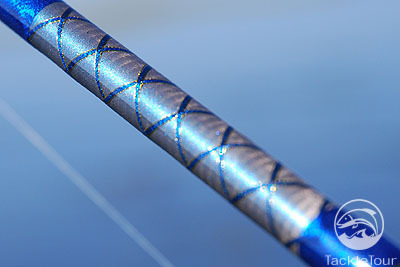 The rods feature a distinct light blue finish and there is blue and gold threading and highlights throughout the length of the rod. Directly above the patented hook hanger is a criss-cross pattern that ushers in visions of traditional rods of years past. While I personally prefer cleaner more understated layouts the Harmonix rod does stand out in a sea of me-too rods. 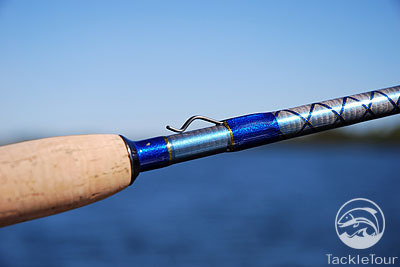 The rods are constructed with of IM6 carbon graphite and blue alconite guides are used to complement the rod�s blue blank. The rod is finished with a holographic logo and specifications that flashes different colors depending on the angle and lighting on the blank. Lab Tests: We tested the 6'6" rod in the company's spinning lineup, and as with all test rods the Harmonix rod had to first survive our RoD WRACK. 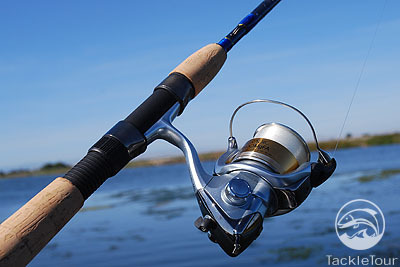 What we found was that between the Harmonix 6�6� spinning rod is a slightly more powerful stick than other similarly rated rods and the rod has a rather fast tip. The rod weighed in at 5.3oz. which is slightly heavier than other rods of similar length, for example the average Loomis non GLX rod between 6-7 feet weighs in between 4.2-4.5oz., the GLX rods often weigh just under 4oz. 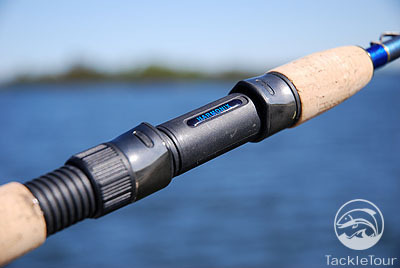 Real World Tests: The Harmonix 6�6� rod is designed to be used for a variety of species including Bass, Walleye, and Stripers. 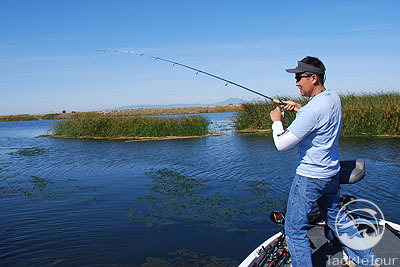 In our own field tests we head to our home water on the California Delta to fish for largemouth bass. We paired the rod with a Shimano Stradic MgFA 2500 size reel and spooled up with Berkley Trilene XL 8lb line. We fished with a variety of lures including shallow running cranks and weightless Texas rigged plastics. 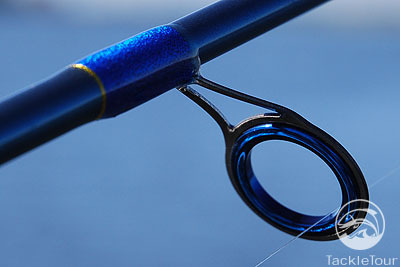 Casting: The Harmonix rod is rated for 1/8-1/2oz. baits but this rod can easily toss 1oz. jigs and bucktails without breaking a sweat. In fact it is at the upper end of the spectrum that the rod most feels at home and I was able to toss deep diving crankbaits well outside the lure specifications with ease. 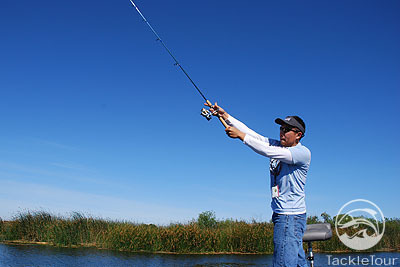 When it came to the lighter lures the rod was able to toss or pitch weightless rigged senkos with no difficulty either.